There are four lodges in the province of Perthshire East that meet on Wednesday evenings which means there is little opportunity to visit each other. As no Lodge in the province have a regular meetings on the 5th Wednesday of the month it was decided a number of years ago that between September and April all 5th Wednesdays would be utilised as an opportunity for the "Wednesday Lodges" to muster in rotation (usually twice per season). At a special meeting on the 30th January 2013 it was the turn of Lodge Scoon & Perth No 3 to host the Muster of the Wednesday Lodges We were pleased to receive a deputations from Lodges St John No 137, The Carse of Gowrie No 871 and Stanley No 1262 lead by their R.W.Ms. The four lodges worked together in an emulation of the 1st degree much to the satisfaction of the members and the many Masonic visitors who attended the meeting. Following the meeting the brethren retired to the lodge refectory and enjoyed harmony together, it was a most enjoyable evening. 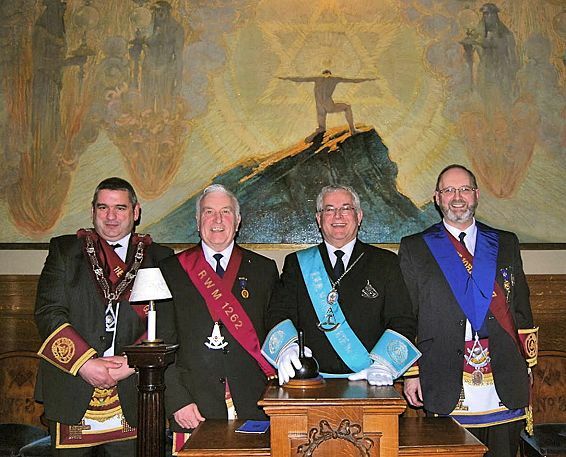 Attached is a photograph of the R.W.Ms of the Wednesday lodges standing in the East of Lodge Scoon & Perth No 3. From left to right, RWM No 871, RWM No 1262, RWM No3 and RWM No 137.